Located on the grounds of the Ford Motor Dearborn Rouge facility, the Ford River Rouge Complex is a Ford Motor Company automobile factory complex located in Dearborn, Michigan. The project included the installation of 60,000 feet of six-inch conduit underground to service two new substations. The conduit runs wound through various size vaults, elevations and manholes. 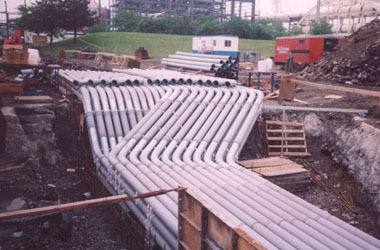 One section of the ductbank required a transition from six stacks of eight to four stacks of twelve to accommodate the conduits crossing over a service tunnel that had to remain enact. The local inspectors required that all couplings be welded in order to maintain ground continuity. Hatzel & Buehler completed this project on time, which was critical to the implementation of energizing the substations in an effort to not delay any of the ongoing operations at one of Ford’s main business complexes.